Bannochie Builders, Inc. are experts at transforming an underutilized family room into the family favorite. 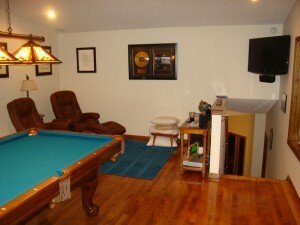 As a Minnesota Licensed Remodeling Contractor we have been performing family room remodeling miracles since 1995. Be inspired to create a family room that fits the Needs of Your Family. A room that is cluttered with electronics, gaming systems and toys can be turned into an Elegant Entertaining Space. A dark TV room can be turned into an Open Living Space that lets you interact while preparing meals in the kitchen. Update an older Fireplace with a new mantle or surround that reflects your design taste. Open Concept Living can be provided by removing a wall that separates the family room from a kitchen or dining room. Install New Hardwood Flooring to add warmth, beauty and a unified look throughout the main living space. Custom Cabinetry creates an instant impact by creating a beautiful solution for displaying or storing all of your family treasures. Crown Molding, Arches, Beams or Built-ins add to the character and authenticity of an older Minneapolis, MN home. New Windows, Paint, Trim and Lighting add the finishing touch to your spectacular family room renovation. Bannochie Builders, Inc. is a Licensed Remodeling Contractor that provides our clients with high quality workmanship on every project. We are experienced remodeling professionals who enjoy transforming an outdated Family Room into beautiful space that your family will truly love. We will handle acquiring all necessary remodeling permits from the City of Minneapolis, MN. Our expertise allows us to remove walls to create an open living space and update a fireplace or install new hardwood flooring to make the room suits your family perfectly. Call Bannochie Builders, Inc. for a Free Estimate on a Family Room Renovation. This entry was posted	on Friday, February 20th, 2015 at 3:52 pm	and is filed under Home Remodeling. You can follow any responses to this entry through the RSS 2.0 feed. You can leave a response, or trackback from your own site.